I just finished reading Unflinching: The Making of a Canadian Sniper by Jody Mitic, who was a sniper with the Canadian Armed Forces 1st Battalion Royal Canadian Regiment. 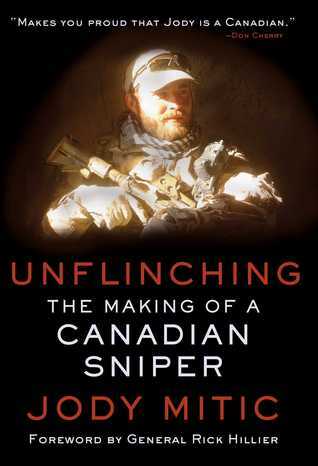 Unflinching is an uplifting memoir on military issues, endurance, and overcoming adversity. Afghanistan, 2007. While on patrol with the 1st Battalion Royal Canadian Regiment deep within enemy territory, sniper Jody Mitic stepped on a land mine and lost both legs below the knee. Though Jody was a dedicated serviceman who had dreamed of a military life since he was a child, it seemed that his fighting days were done. Ever a soldier at heart, Jody was determined to still be of service to his country, and he refused to let his injury hold him back. After only a few short months of rehab, Jody was up and walking again on two prosthetic legs, and only a year later, he was running his first road race. But despite his success in physically recovering from his injury, Jody still struggled to mentally adapt to his new reality. As he experienced first-hand the controversial treatment of Canadian veterans, Jody turned his efforts towards developing programs for wounded veterans and publicly advocating on their behalf. With a renewed purpose to guide him, Jody came to find a new lease on life. I found this book to be a very uplifting read. It is the story of Jody's life, who as a teen lived a life without purpose until he decided to join the army and received some direction in his life. After joining, though, he had some issues and he tells of some of the personal battles he fought just to stay in the force. Jody really emphasizes the respect and camaraderie of soldiers, not only those in the Canadian force, but also between Canadian and their US army counterparts. The book also highlights what I have always had a problem with when it comes to our politicians and the armed forces. We send them off to fight for Canada but cut back on the dollars to equip them properly. This theme comes through over and over, whether it is regards to clothing, weapons or vehicles. If we are asking them to lay down their life for our country, we should do our very best to ensure that everything they receive is top notch. Jody also highlights the lack of support, physically, mentally and financially for wounded soldiers who return home with massive wounds. This book is very well written and one that should be required reading for every member of Canadian Parliament.